I fell off Supernova Elite pace last week for the first time since January 3rd, largely thanks to a trip to London to go and watch the TNA Wrestling event there. It's still early days but the burn is starting to set in a little bit. I'm turning my alarm off when it wakes me up in the morning a little too often, and my VPP per day average seems to be more around the 2800 mark than the 3500 mark, which is a better target to make SNE more viable. The wrestling show was a little disappointing. I am generally a WWE fan and don't watch much TNA, but the wrestling there is usually high quality, and seeing as this was the company's biggest live crowd to date (around 10,000 fans), you'd think the wrestlers would go all out to put on a great show. To me though it felt like they were just 'phoning it in' for the most part. Having said that it might just be that watching wrestling live isn't as good as seeing it on TV, which is something I've found in the few times I've been to see wrestling. The camera angles definitely play a big part in making wrestling look real, and perhaps the lack of hype from a commentary team has a negative impact as well. One bit of the show that made for uncomfortable viewing was the Ric Flair match. I was pretty disappointed to see Ric Flair return to wrestling after being given an awesome storyline in WWE for his retirement, which culminated in his last match being against Shawn Michaels at Wrestlemania 24 about 3 years ago. It was the perfect send-off and was a very good and emotional match. Apparently though, he has been raped by his divorce settlements from his three failed marriages (he's currently on his fourth wife!) and he needs the money. Consequently I couldn't help but feel sorry for this guy, who is 62 years old and really shouldn't be wrestling. He still wrestles in trunks, and watching an old wrinkly guy wrestle an athletic Doug Williams, who at 39 is reasonably old in wrestling terms himself, just doesn't seem right. The match was very slow paced, and Flair was the only guy to 'blade' all evening. Watching a 62 year old bleed all over seemed a little unnecessary. I can't help but think Flair is tarnishing his legendary career by continuing to wrestle and hope he can find other ways to pay off his ex-wives soon. Poker-wise, things are going fairly well. At the moment it feels like I'm taking 5 steps forward, 4 steps back all the time as every time I have an upswong I seem to get doomswitched back to almost where I was before. At least it's not 5+ steps back I guess. 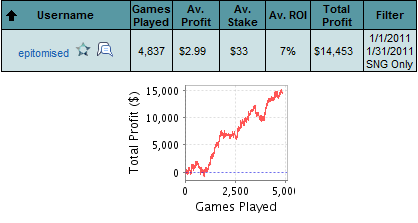 January ended up being my most profitable month since I started playing SNGs, which justifies my plan to go for Supernova Elite. I also put in the most volume I ever have, playing over 4,800 SNGs. My previous record was 3,700 in November 2009 which was for a prop bet at the time. So it's been a really positive start, although tbh I'm actually a little disappointed with my ROI in 18-mans so far, as it's less than I was achieving last year. That's possibly attributable to the amount of volume I'm putting in, but I am doing my best to stay on top of my game and not pick up leaks, which is easily done when you're playing as much as I am. Check out Nick Rainey's "January Awards" if you're interested in seeing how other MTT SNG grinders faired in January. 7 Comments to "Wrestling to stay on pace..."
Nice profit! I would love to get results like that (maybe I do have to switch to another game?). On one side I really can't see why you wouldn't play more if you know you are a big winner in the game anyway. On the other side I know the feeling that it's sometimes hard to put in the volume and losing would make it only easier as you really want to grind back your losses! Congrats on a great month. I actually was half finished with a little blurb about you, but decided to wait for Feb awards because I wanted to make sure it was perfect. Sick garph sir. You inspired me to try the 18 man (though just 16's) and results have been good over smallish sample (300 games). Hehe that's cool Nick. Congrats on a sick month yourself! Glad to see you back crushing :) Yeah Ric Flair's been around a lonnnng time. Thanks man. Re: switching games. Maybe man, LHE is pretty much a VPP grind right? If you have the willingness to study hard, which I read in your blog that you do, you would do just fine in SNGs and probably on the new CAP tables. But also doing what you are comfortable with is important. I'm playing about as much as possible this year, found it more difficult in previous year...beating the games for a decent rate doesn't mean it isn't a grind, and sometimes it's hard to motivate yourself to do hard work however well it's going! Meh, falling behind pace is okay when you are crushing it at the tables like you are. Good luck dude, just keep up the pace so you don't crush yourself in the last 2 months!